Ahead of Mother’s Day, Express Employment Professionals today released results from a special edition survey revealing the attitudes of working moms. When asked, “Would you work if you didn’t have to? ", sixty-two percent of working mothers said “yes,” compared to 69 percent of working fathers who said the same. On behalf of the entire Express team, I wish a Happy Mother’s Day to all the moms out there! 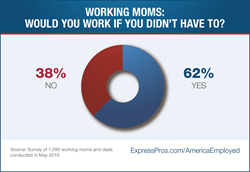 Ahead of Mother’s Day, Express Employment Professionals today released results from a special edition survey revealing the attitudes of working moms. Respondents were asked, “Would you work if you didn’t have to?” Sixty-two percent of working mothers said “yes,” compared to 69 percent of working fathers who said the same. “The working world has changed in many ways for parents throughout the years, with the increase in working mothers in the past four to five decades being the most dramatic change,” said Bob Funk, CEO of Express, and a former chairman of the Federal Reserve Bank of Kansas City. “But as this survey shows, for many mothers and fathers—around a third—whether to stay home with children or work isn’t a choice they get to make for themselves. Understandably, this reality has led to an increased focus on the options and flexibility available to parents in the workplace. “On behalf of the entire Express team, I wish a Happy Mother’s Day to all the moms out there!” added Funk. The survey of 1,059 working moms and dads was conducted in May 2016. The survey of 390 businesses, which are current and former clients of Express Employment Professionals, was conduced in April 2016.